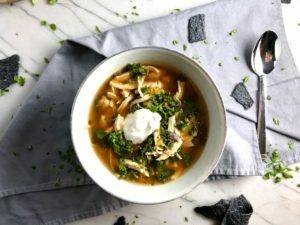 5-Ingredient Chicken Tortilla Soup with Kale! 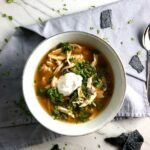 So, what goes into a quickie, 5-ingredient Chicken Tortilla Soup? 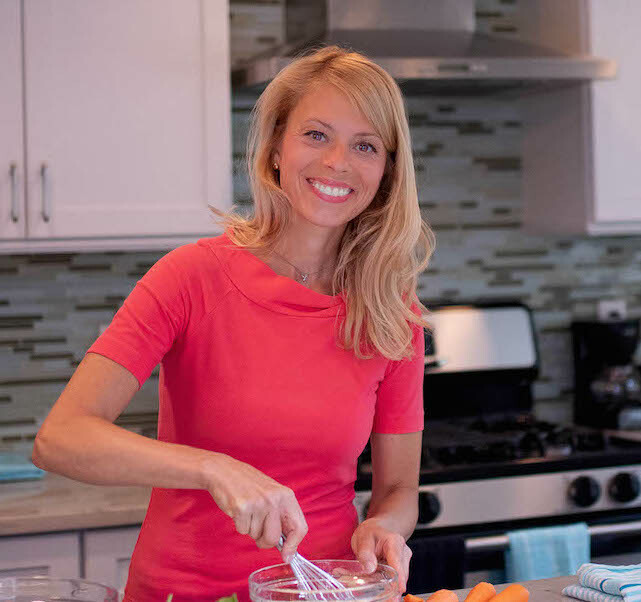 You also need water, some salt & fresh ground pepper, plus whatever garnishes you may like, such as shredded cheese or sour cream, but seriously, you will not need anything else – it’s THAT GOOD! 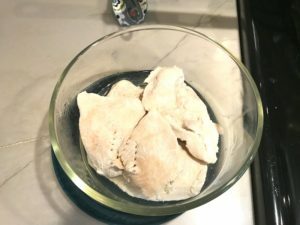 To begin, you simply place the chicken breasts and scallions into boiling water that you have seasoned with salt and pepper to taste. You need enough water to cover the chicken with about 3/4 inch additional above the chicken. Boil for 10 minutes or until fully cooked through. Remove chicken from the liquid, which is now a broth and set aside in the fridge to cool for about 5 minutes. 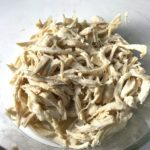 When the chicken is cool enough to touch, start shredding it all up into small bite-size pieces. While the chicken is cooling, you can whisk into the broth, 1/2 packet of your favorite taco seasoning and bring it up to a light boil. 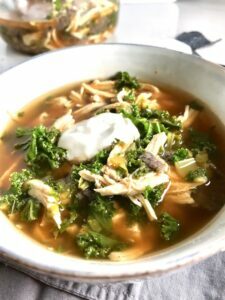 Place the shredded chicken back into the cooking broth and add thinly sliced kale. Cook for 5 minutes, then add 1/2 cup crushed tortilla chips and mix into the soup and cook for another 5 minutes. The tortilla chips will blend into the soup to both thicken it and flavor it with the delicious corn chip flavor. That’s it! Serve in bowls, garnish with sour cream and more crushed tortilla chips & Enjoy! Clean the Kale, remove the stems and thin-slice it making sure there are no large pieces that are difficult to scoop with a spoon in the soup. Dice the scallions. Crush the tortilla chips. Bring a medium pot of water, about 5 cups of water, with the scallions (save some of the greens for garnish if you desire) 1 tsp salt and 1 tsp fresh ground pepper, up to a boil. Add the chicken breasts and boil for 10 minutes or until chicken is cooked through. 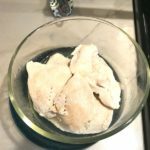 Remove chicken to a bowl and put in fridge to cool down. While the chicken is cooling, whisk into the chicken liquid (now broth) 1/2 of a packet or 1 heaping teaspoon of your favorite taco seasoning. Taste for seasoning and add more taco seasoning as needed (depends on how much cooking liquid you have in the pot and how spicy you want it). 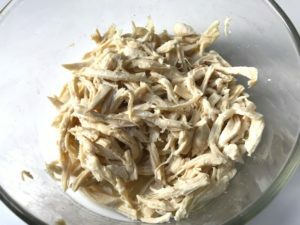 Once cooled, shred the chicken with fingers into small, bite size pieces. 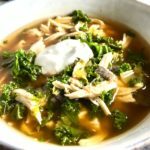 Add the chicken and Kale to the soup liquid and bring back to a light boil for 5 minutes. Add 1/2 cup of the crushed tortilla chips and stir. 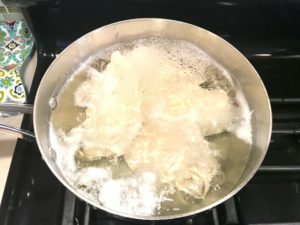 Cook for another 5 minutes. < Previous Loaded Cauliflower Tots! Thank you! 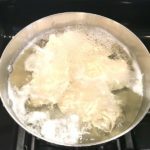 I love these easy one-pot meals. I hope you love it as much as I do!